Υποβλήθηκε από seo στις 05.04.2019 - 15:00. 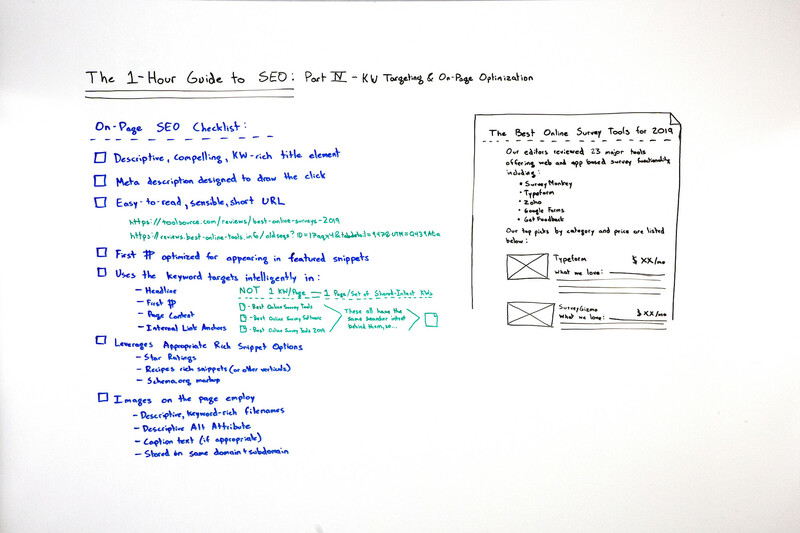 So what I've done here is created a sort of brief, on-page SEO checklist. 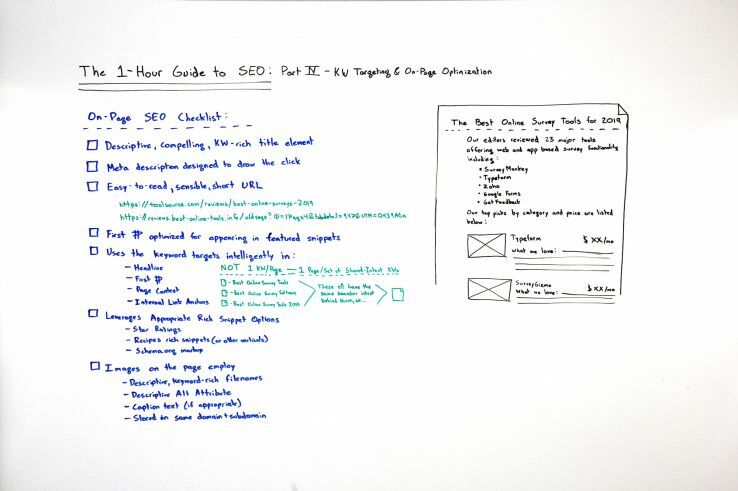 This is not comprehensive, especially on the technical portion, because we're saving that for Part V, the technical SEO section, which we will get into, of this Guide. In this checklist, some of the most important things are on here. Many of the most important things are on here, and those include things like a descriptive, compelling, keyword-rich but not stuffed title element, also called the page title or a title tag. 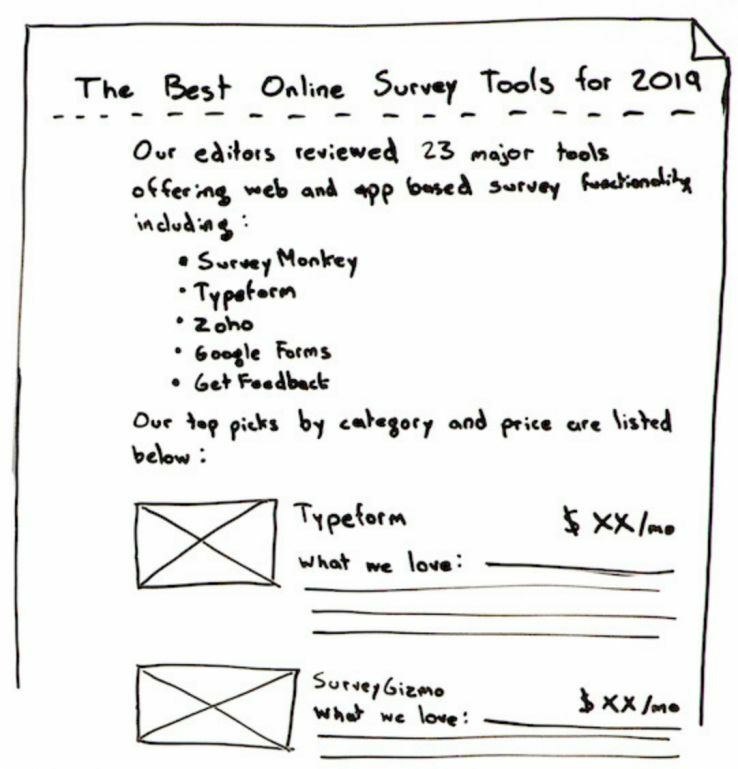 So, for example, if I am a tool website, like toolsource.com — I made that domain name up, I assume it's registered to somebody — and I want to rank for the "best online survey tools," well, "The Best Online Survey Tools for 2019" is a great title tag, and it's very different from best online survey tools, best online survey software, best online survey software 2019. You've seen title tags like that. You've seen pages that contain stuff like that. That is no longer good SEO practices. Second, a meta description. This is still used by search engines, not for rankings though. Sort of think of it like ad text. You are drawing a click, or you're attempting to draw the click. So what you want to do is have a description that tells people what's on the page and inspires them, incites them, makes them want to click on your result instead of somebody else's. That's your chance to say, "Here's why we're valuable and useful." An easy-to-read, sensible, short URL. For example, toolsource.com/reviews/best-online-surveys-2019. Perfect, very legible, very readable. I see that in the results, I think, "Okay, I know what that page is going to be." I see that copied and pasted somewhere on the web, I think, "I know what's going to be at that URL. That looks relevant to me." Or reviews.best-online-tools.info. Okay, well, first off, that's a freaking terrible domain name. /oldseqs?ide=17 bunch of weird letters and tab detail equals this, and UTM parameter equals that. I don't know what this is. I don't know what all this means. By the way, having more than one or two URL parameters is very poorly correlated with and not recommended for trying to rank in search results. So you want to try and rewrite these to be more friendly, shorter, more sensible, and readable by a human being. That will help Google as well. That first paragraph, the first paragraph of the content or the first few words of the page should be optimized for appearing in what Google calls featured snippets. Now, featured snippets is when I perform a search, for many queries, I don't just see a list of pages. Sometimes I'll see this box, often with an image and a bunch of descriptive text that's drawn from the page, often from the first paragraph or two. So if you want to get that featured snippet, you have to be able to rank on page one, and you need to be optimized to answer the query right in your first paragraph. But this is an opportunity for you to be ranking in position three or four or five, but still have the featured snippet answer above all the other results. Awesome when you can do this in SEO, very, very powerful thing. Featured snippet optimization, there's a bunch of resources on Moz's website that we can point you to there too. So if I'm trying to rank for "best online survey tools," I would try and use that in my headline. Generally speaking, I like to have the headline and the title of the piece nearly the same or exactly the same so that when someone clicks on that title, they get the same headline on the page and they don't get this cognitive dissonance between the two. The page's content, you don't want to have a page that's talking about best online survey tools and you never mention online surveys. That would be a little weird. Instead, because these all share the same searcher intent, I want to go with one page, just a single URL that targets all the keywords that share the exact same searcher intent. If searchers are looking to find exactly the same thing but with slightly modified or slight variations in how they phrase things, you should have a page that serves all of those keywords with that same searcher intent rather than multiple pages that try to break those up, for a bunch of reasons. One, it's really hard to get links to all those different pages. Getting links just period is very challenging, and you need them to rank. Next, you want to leverage appropriate rich snippet options. So, for example, if you are in the recipes space, you can use a schema markup for recipes to show Google that you've got a picture of the recipe and a cooking time and all these different details. Google offers this in a wide variety of places. When you're doing reviews, they offer you the star ratings. Schema.org has a full list of these, and Google's rich snippets markup page offers a bunch more. So we'll point you to both of those as well. Last, but certainly not least, because image search is such a huge portion of where Google's search traffic comes from and goes to, it is very wise to optimize the images on the page. Image search traffic can now send significant traffic to you, and optimizing for images can sometimes mean that other people will find your images through Google images and then take them, put them on their own website and link back to you, which solves a huge problem. Getting links is very hard. Images is a great way to do it. The images on your page should employ descriptive, keyword-rich filenames, meaning if I have one for typeform, I don't want it to be pick one, two or three. I want it to be typeformlogo or typeformsurveysoftware as the name of the file. Caption text, if that's appropriate, if you have like a photograph and a caption describing it, you want to be descriptive of what's actually in the picture. These files, in order to perform well, they generally need to be hosted on the same domain and subdomain. If, for example, all your images are stored on an Amazon Web Services domain and you don't bother rewriting or making sure that the domain looks like it's on toolsource.com/photos or /images here, that can cause real ranking problems. Oftentimes you won't perform at all in Google images because they don't associate the image with the same domain. Same subdomain as well is preferable. If you do all these things and you nail searcher intent and you've got your keyword research, you are ready to move on to technical SEO and link building and then start ranking. So we'll see you for that next edition next week. Take care.